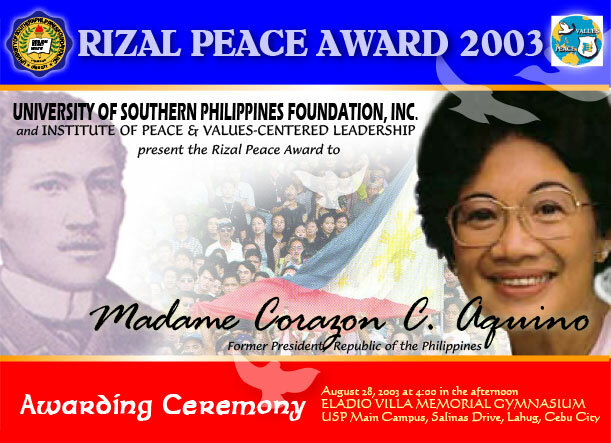 This was the newspaper advertisement for the event when University of Southern Philippines (USP) along with its Institute of Peace &amp; Values-Centered Leadership proudly awarded Madame Corazon ‘Cory’ C. Aquino the Rizal Peace Award. It’s a great honor for the university to have her grounds walked upon by a former President of the Republic of the Philippines. It was published in full color in The Freeman newspaper on August 28, 2003. The background design has a bluish foggy effect portraying a national history: Dr. Jose P. Rizal and the first People Power revolution of EDSA (Epifania de los Santos Avenue). We have searched the net for a good picture of Cory Aquino and the one that was chosen for the layout design was rather small with a file size of only about 10 kilobytes, so small in fact that it was rejected by Go Large, the company assigned to print the stage backdrop. They eventually replaced it with a more recent picture of Cory which was quiet less familiar. However, the one used above was carefully enhanced to compensate for lack of details. It simply was irreplaceable for it has the best smile and the most radiant face of Cory.